We are Davy & Miet, vegetarians and inseparable since 2000 and roaming the globe in search for a special place to call our own. We spent nine years living in Antwerp, the second largest city in Belgium (remember, it’s not a big country) before moving to Lanzarote in October 2016. You might wonder: “Was it a good decision?” Our answer is definitely yes! After a long quest for the right location, we launched our cosy vegetarian and vegan restaurant named Bistro Árbol in Puerto del Carmen, Lanzarote! We have two lovely trees on our terrace hence the name. What more would you want on an island where there are barely any trees? And then there’s also the tree of life and the family tree… it’s just a great symbol for who we are and what we stand for. Our interests are vegetarian & vegan food and the enjoyment of cooking for others along with great music. Additionally, we love to travel and are genuinely interested in the world and its (food) cultures. And it’s been our aim to unite all these elements in Árbol. We are sure that you will know what we are talking about after visiting us. We like to be mindful consumers and therefore buy as many local products as possible. We aren’t fans of processed food, so creating tasty vegetarian and plant-based dishes with fine and fresh ingredients is our standard. We don’t go for anything less! Oh, and if you have any allergies, please let us know. We have a great selection of gluten-free dishes as well. What’s more we also like to have a good drink with a nice blending of music in a fun atmosphere. 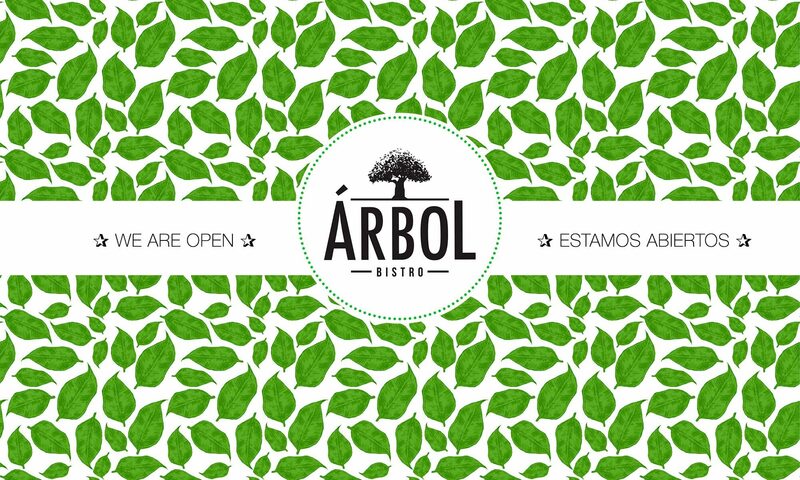 Árbol is a place where you can have a chat with friends and family or just relax on your own while enjoying a Belgian beer or a local wine, if you feel like it. We love music. It’s not something that we take lightly. Hey, we spend the entire day working here so it better be in a nice atmosphere, haha. So we’ve brought our Technics record player, along with our own record collection and Uncle Willy’s record collection (big up!) in order for you to enjoy real music on the real deal: vinyl. And if you think you can do better than us, do bring your own to enjoy! We serve vegetarian, vegan (yes, also desserts! ;-)) and gluten-free dishes, all homemade with love. If you have any allergies, please let us know and we will work something out. Check out our menu! Think global, act local really means something to us. We also like to be transparent. We make everything from scratch and quality goes first. We have carefully created our menu so there is food for everyone. If it’s fast food you’re looking for, we suggest you go to Burger King. It’s just around the corner. We use, when possible, vegetables, fruit and herbs from the island. Luckily some of the other Canary Islands are greener and therefore yield a wider variety of vegetables and fruits. We also like to buy products from an ecological farm on Lanzarote. Furthermore, we have our own little terrace with herbs that of course flavour our best dishes and drinks. The cheese we use is from Quesería Tinache in the village of Tinajo, near de National Park. The families of Mario Morales and Esteban Quintero have been making cheese for generations. They have won numerous prices with their cheeses. Our house wine comes from the peninsula but all our other wines originate from the Island. We’ve made a selection of wines of which we think are the best. The bodegas we work with are Bermejo, El Grifo and La Grieta. And from time to time we also offer ‘guest wines’. Being good Belgians, we can’t live without a good beer. We serve the best lager of Spain ‘Estrella Galicia’ on draft and in bottles we have a great selection of Belgian beers or try the local Jable – Malpeis, it’s a great blond beer produced in Tinajo. Salud! Andy and Astrid from Andy Brot make their burger buns especially for us and we also use their brown bread. They bake the traditional German way and add no unnecessary ingredients to their dough. Plain and simple. We are located on the beautiful island of Lanzarote. To be more precise, in Puerto del Carmen in Centro Comercial Playa Blanca, also known as Centro Barracuda. Our square may be a bit harder to find but it’s worth the while. If you want to book a table, please contact us by phone. We are not a restaurant that is suitable for big groups. As there are only the 2 of us, if you want to come with more than 6 people, make sure to book in advance. Hope to see you soon!